Today, Google unveiled Stadia, a new cloud-powered streaming platform. Google announced the news during a keynote, hosted live from GDC in San Fransisco. Google CEO Sundar Pichai took to the stage to unveil Stadia, stating that the company had been “building a game platform for everyone”. The platform is cloud-fueled, which means players can play games across multiple devices, including laptops, TVs and mobile phones without the need for powerful hardware. A demonstration was shown, showcasing the ability for players to simply click on an advert placed inside a YouTube video, which will take them directly to a playable game in less than five seconds. The first title to be shown was Assassin's Creed: Odyssey. 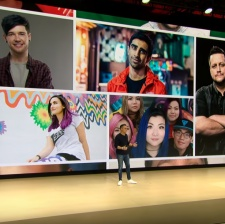 Stadia promises new features for YouTube creators too. YouTube's head of gaming Ryan Wyatt took to the stage to speak about the experience Stadia will give to creators and their communities. "Gaming has always been the backbone of YouTube," Wyatt said. "Stadia is designed to bring creators together." Wyatt also noted that over 200 million people watch gaming content on YouTube every day, and over 50bn hours of content was watched in 2018. Stadia's new Crowd Play function will allow fans and viewers to jump into games with their favourite creators at the click of a button. YouTube creator Matthew 'MatPat' Patrick also made an appearance during the keynote. Patrick is best known for his work on YouTube channel, The Game Theorists, which has over 11 million subscribers. "For creators, our audience is our lifeblood," MatPat said. "Stadia not only empowers me to share my work, but it allows me to form a stronger bond with my audience. Wyatt also mentioned that Stadia will unveil new ways for YouTube creators to make and monetise their content. Stadia is set to release sometime in 2019, launching first in the US, Canada, UK and Europe.